Scot Pendlebury is predicting a tough contest against Richmond on Friday night. 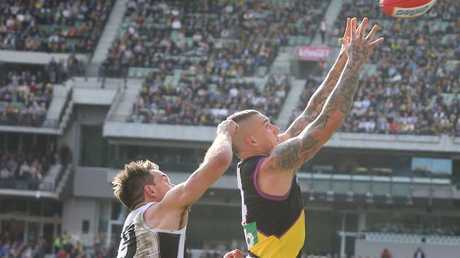 COLLINGWOOD is bracing for a "brutal" contest in Friday night's blockbuster preliminary final clash with Richmond, with skipper Scott Pendlebury declaring Levi Greenwood tagging superstar Tiger Dustin Martin anything but a fait accompli. Richmond defeated the Magpies by 28 points when they last met, in Round 19 at the MCG, with Greenwood putting a hard tag on the Brownlow Medallist, who was well-held until a blistering late surge. 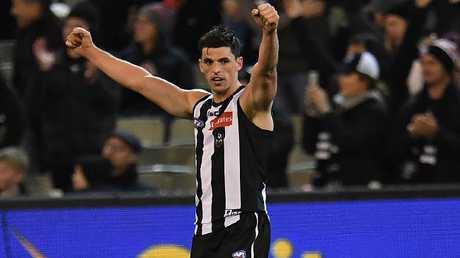 Pendlebury said that the Magpies have a "slightly different look now" and may not look to directly negate Martin alone. "Obviously Levi last time went to him but with Levi playing back, there will probably be different plans this time," Pendlebury said. "I don't ever think you get hold of Dusty. "It would great if we could try and nullify him but he's one of the best players in the game. "There's Dusty, there are so many good players at Richmond. They're so even, so you can't really just try and take him completely out. "You've got to look after everyone." Collingwood premiership player Mick McGuane called on Magpies coach Nathan Buckley to drop Chris Mayne in favour of Darcy Moore - who has been battling a hamstring injury - who he backed to take on Coleman medal-winning Tiger Jack Riewoldt. Pendlebury said if Moore declared himself to be fit, it would create a "selection headache" for coaches. "But that's finals football - there's tough calls to be made," he said. "It'd be great to have a guy like Darcy - if he's right to go - come back in. "They made a big call for the first final with guys like Goldy (Tyson Goldsack) and (Adam) Treloar coming in, so that's over to them. "As players, we don't worry. If Darcy's next to me on Friday night, great. If they deem him not quite ready, I'll be confident whichever 22 go out there." Scott Pendlebury said he considered preliminary finals to be the biggest games of the year. 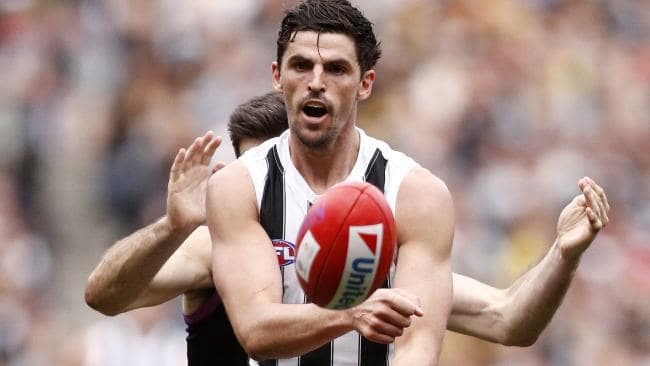 Pendlebury, 30, has played in four preliminary finals in his 275-game career at Collingwood and said he considered them to be the "biggest game of the year". "Every prelim that I've played in, for some reason, the crowd's a lot louder than a Grand Final crowd and that type of thing," he said. "I don't know why they're so tough to win. They're brutal games of football because everyone knows what's coming after that. "Our guys are looking forward to this week and embrace all the hype that's going to come with it, and then just get ready to go out there and play our way on Friday night." He said the intensity would lift, and backed his teammates to adjust in what he said is nearing their peak. "I feel like we are playing close to our best football," he said. "We've learned some really good lessons in the last couple of games and we think we're going well with what we're doing. "The guys are learning and I think we're in a really good space for Friday night. We'll plan and prepare for the Richmond side that's been the best side all year and try and find a way whether we can expose them." Meanwhile, Pendlebury isn't deterred by a few loose teeth, with the Collingwood skipper adamant that his hampered diet will not affect his fitness. The Magpies captain copped a knock to the mouth early in the team's qualifying final loss to West Coast in Perth, and could require dental surgery post-finals. But he maintained that his teeth are "alright", bar a few issues with eating. "They're a little bit loose, but I'm on the soft foods. 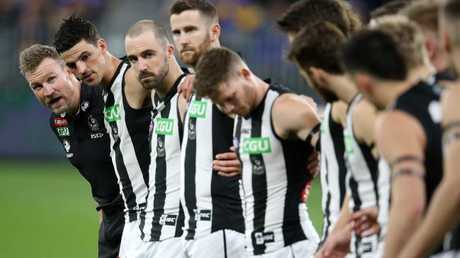 They'll be OK," Pendlebury said. "I can't bite into stuff which is a bit of an issue, and I'm trying to keep my young fella away from headbutting my teeth clean out." He said that the problem had not affected his preparation for Friday night's preliminary final against Richmond. "Not really - not much at all. My weight's the same and all that type of stuff, but I don't really want to bite into anything," he said. "Anyone that's had teeth issues before knows how sensitive they get."